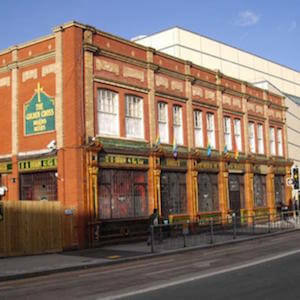 Located in a Grade II listed building, the famous Golden Cross pub is a favourite haunt of the gay community in Cardiff. With glazed tiles and traditional signage, the Cross certainly looks the part from the outside. Inside the bar is friendly, with a great relaxed atmosphere during the day. At night, the dance floor gets busy. Karaoke is a regular event here. There’s a pool table and free WiFi, too. Lewis on 15-Apr-2016 | Reply	Problem with this review?